"Steven Universe" is a coming-of-age story told from the perspective of Steven, the youngest member of a team of magical guardians of the Earth called the Crystal Gems. In Steven Universe, the world is protected from evil threats by the Crystal Gems, a group of intergalactic non-binary warriors who use the power of special gem stones embedded on their bodies to summon magical weapons. 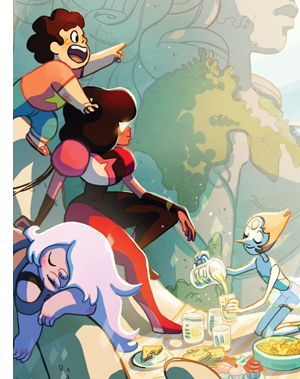 The four Gems are: Garnet, Amethyst, Pearl and Steven. Steven is a young boy who inherited a gem stone from his mother, a Crystal Gem named Rose Quartz. As Steven tries to figure out the secrets to using his gem, he spends his days in Beach City doing activities with the other Crystal Gems, whether it's helping them save the universe or just hanging out. Steven Universe has become a beloved show for many reasons, but also because it is known for breaking barriers and including a wide array of unique characters rarely, if ever, seen on western TV and animation. If you are a fan of anime (which you obviously are..) I believe you'll love this show! It pulls elements and references from classics while still having fresh beautiful artwork, story, designs, and soundtrack! P.S. You can make your own threads too! KiruKiru (2 anos atrás) #12558818Is this club still alive? Looks like some episode clips have been leaked. You can find them here and here, though I must warn that they are major spoilers. New episode dates are TBA. neL (3 anos atrás) #3257479Sorry guys, they postponed the new episode to September ):.